Hvorfor betale for en dyr cab ride, når der er et simpelt, omkostningseffektivt alternativ til rådighed 24/7? Rejser fra Baltimore-Washington International Airport (BWI) til ethvert hotel i Baltimore's Inner Harbour hotelkvarter via dette økonomiske, delte køretøj. Nyd den stressfri komfort og bekvemmelighed ved en-vejs, dør-til-dør rejse - 24 timer i døgnet, syv dage hver uge. Der er højst to kufferter og to små vedligeholdelsesdele pr. Person, tak. At komme fra lufthavnen til et lokalt hotel kan være kompliceret, men det behøver ikke at være. Der er en bekvem løsning, der tager alt det besvær og gætte ud af at leje en bil eller betale for en dyr taxa efter en lang flyvning. Forenkle hele processen ved ankomsten til Baltimore-Washington International Airport (BWI). Rejser fra lufthavnen til ethvert hotel i Baltimore Inner Harbour hotel distrikt i stil og komfort ved at arrangere et delt-ride transfer køretøj. Du skal blot angive ankomstoplysninger og fuld adresse på stedet i Baltimore-området. Overførslen vil blive bekræftet med det samme og et rejsekupon udstedes til stede for chaufføren. Der er højst to kufferter og to små vedligeholdelsesdele pr. Person, tak. Service fra Baltimore-Washington International Airport til Baltimore's Inner Harbour Hotel District er tilgængelig 24 timer i døgnet, syv dage om ugen, så det er ligegyldigt, når flyet ankommer. Denne ultra-bekvem form for transport vil altid være klar til at rulle. Unfortunately my trip for pickup at the airport was not smooth. It took two hours of trying to find the Super Shuttle rep. 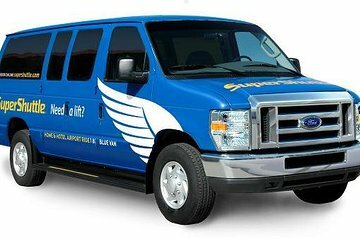 I called the Super Shuttle dispatch 4 times and received different locations and instructions each time. The printed information online in my email was out of date. After locating the rep, the van arrived in the prescribed 30 minutes and the trip to the hotel was fine. It was a very frustrating experience without a desk or designated person in place to communicate with for the van. This was magnified by the dispatchers having different information. I will say that the dispatchers tried to give me good information and most were patient on the phone. Unfortunately, my experience was not a positive one for the second time. First, there was no mention in the booking that if you were not going to a hotel - you would have to pay more than what you had already been charged , and there was no explanation given as to why there would an additional amount charged, secondly it is not clear as to why a rider has to be subjected to being driven pass their destination location just to accommodate the other passenger who is going to a hotel in the downtown area lastly, the driver did not appear knowledgeable of the areas that he was going too, of which makes for a very uncomfortable ride. Even thou the flight number and time are given at booking, we still had to have the Super Shuttle employee at the curb notify the shuttle service to pick us up and took 25 mins. If I knew that I wouldn't have booked the service. Use Uber instead. Good price however had to wait about 45 min at airport until they launched the shuttle. My fellow travel companion and I waited over an hour for a pick up. We called Super Shuttle 4 times during this time. It was frustrating since the company knew the time of our arrival at the airport. Other people were waiting, too, and one had an app that showed the Super Shuttle at a McDonalds for a significant period of time. We all wondered if there was only one Super Shuttle vehicle for all of Baltimore. The transfer from the hotel back to the airport took even longer.....an hour and a half driving around Baltimore, picking people up. The driver went to the same Marriott hotel 3 times without ever picking up a passenger. One passenger on the van missed her flight. The driver never offered an explanation or apology never talked at all. this is ridiculous. the trip was last fall and the only thing you did for me was have transportation to the hotel from the airport. no big deal - this was the first time you got it right! 1st time using this service. The supper Shuttle rep was not very helpful. There was no address of the hotel on my voucher. So I was told she did not know where to take me. It took very long for my ride because the rep did not suggest anything. I had to go back into the airport and phone reservation for my address. It was a horrible raining day and a long day. It would be very helpful if the address is supplied on the voucher for all hotels. I would use this service again and prepare better myself. Buyer beware. We used the service to get us from the Baltimore Airport to the hotel. Was not happy with the service. At the airport we were told it would be 10 mins and to go over there and wait. After half hour I went up and asked. Got the go around and said it would be 15 mins. Twenty five minutes a man picked us up. When we got to the area of the hotel we let us off at the corner and told us to walk down the street to the hotel. He did not help us with our luggage. We couldn't understand why he couldn't leave us at the front door where there was a bell man to help us with our luggage.